Yes, I’ve found a new love. 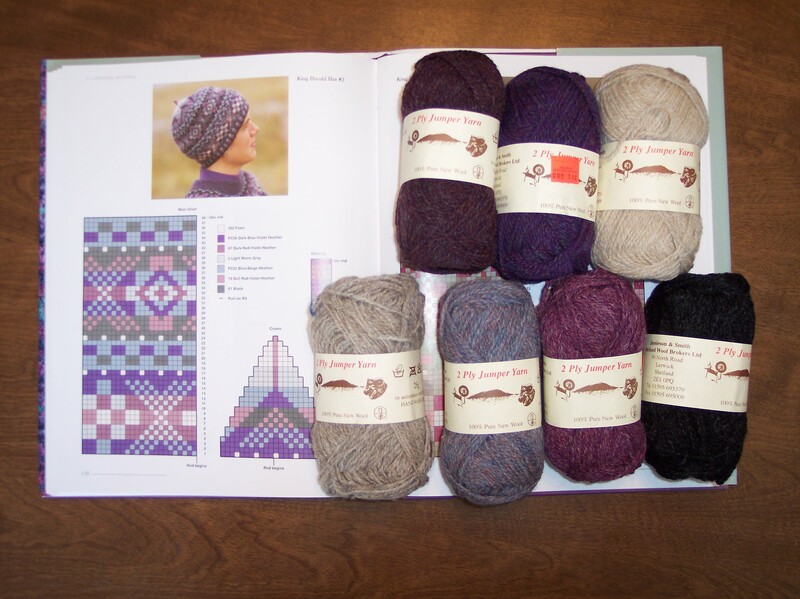 Jamieson and Smith’s 2-Ply Jumper Yarn, Shetland wool. Perfect for Fair Isle knitting. You may recall that, having been kicked around by Fair Isle knitting for years, I finally conquered my nemesis, thanks in large part to the help of one Elizabeth Lovick, who offered her stupendous Fair Isle Workshop to we members of the EZasPi Yahoo! Group. 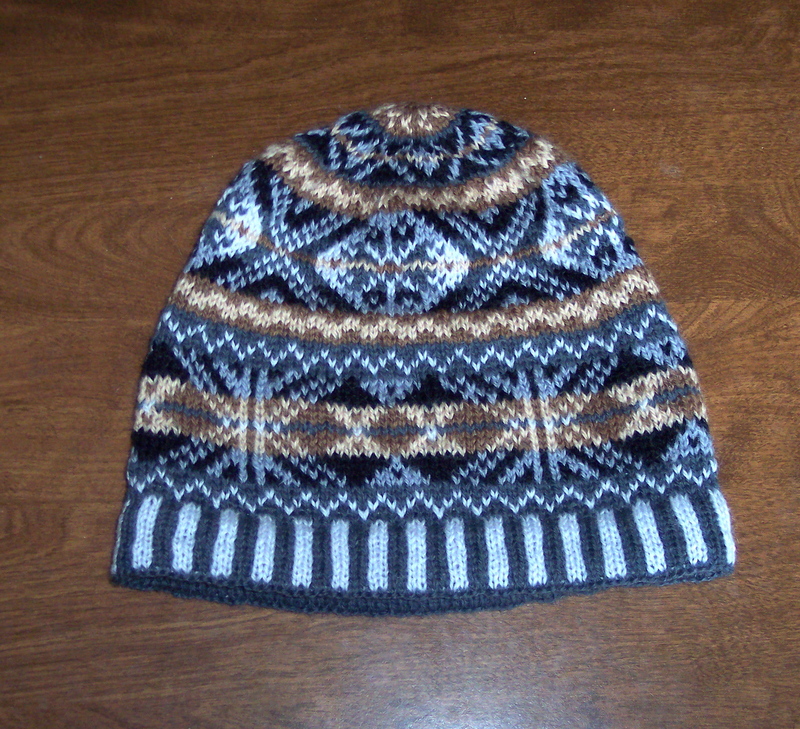 I was able to complete a Fair Isle beanie that I am actually proud to wear. Anyway, I enjoyed knitting the beanie so much that I decided I just had to do another. And some more practice before I take on a big Fair Isle project like a sweater couldn’t hurt, right? So I decided to do another hat, only this time I purchased J & S, to do it up right, doncha know. The J & S colors are very rich, especially compared to the Maine Line solid colors. They are heathered in a way that adds a lot of depth to the color, something that is lacking in the solid color of the Maine Line. At this point, I must interject that Maine Line is available in a limited palette of heathers, but I don’t have any in my stash, nor do I have a color card, so I cannot comment further. I don’t know whether you can see the difference in the depth of color from this picture, but here is the ribbing of my King Harald’s Hat done in J & S.
Working with the J & S is a dream. I am a right-handed thrower, but I taught myself to do stranded colorwork with two hands. That means that I hold one of the colors in my right hand and throw it as usual, and I hold the other color in my left hand and scoop it, a la “Continental” knitting. 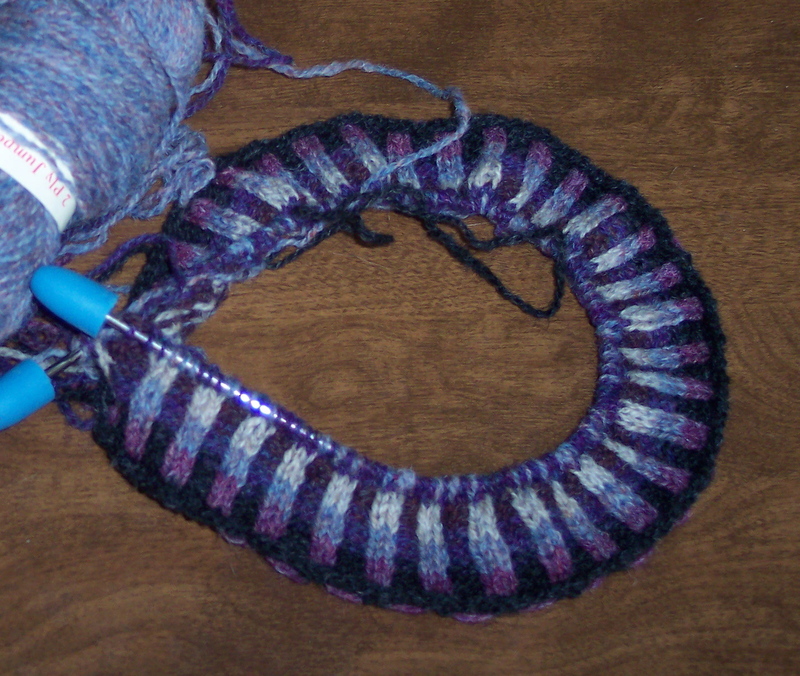 The most difficult part of two-handed colorwork for me is to get the proper tension with the left-hand yarn. I normally wrap the yarn around my pinky before looping it over my index finger in order to maintain a good tension. But with the J & S yarn, I can hold the yarn in my left hand exactly as I do in my right, with the yarn going over rather than around my pinky, under my ring and middle fingers, then over the index finger. Tensioning is much easier.